Nikolai Andreyevich Rimsky-Korsakov (18 March 1844 – 21 June 1908) was one of the The Five composers: Mily Balakirev, the leader, César Cui, Modest Mussorgsky and Alexander Borodin who wanted to create a specifically Russian music. The Arabian Nights reached Western and Eastern Europe in the eighteenth century. They did not replace Charles Perrault‘s (12 January 1628 – 16 May 1703) Contes de ma mère l’Oye FR (Tales of Mother Goose) published in 1697, but enriched the répertoire of stories that could be set to music. Orientalism was not knew to Europe, east and west. The Orient helped shape the European imagination from the time of the Crusades, if not long before. For instance, Italian-language countries had been exposed to the travel accounts and tales of Marco Polo (c. 1254 – January 9, 1324), written as Il Milione. Among early twentieth–century ballet companies, none was more popular than Sergei Diaghilev‘s Ballets Russes and among the ballets he produced was Scheherazade (1910), set to the music of Rimsky-Korsakov. The ballet was choreographed by Michel Fokine and performed in 1910. 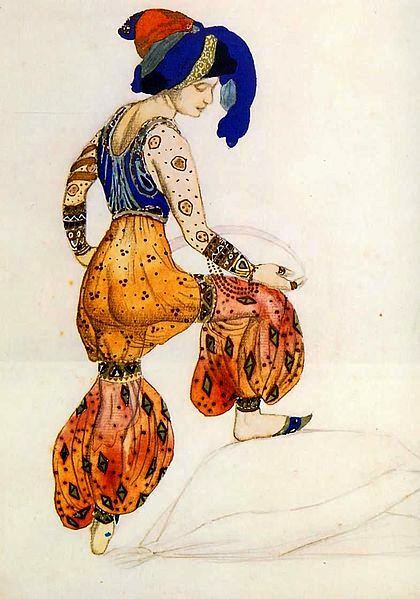 Léon Bakst had designed the appropriate sets and costumes and the ballet starred Vaslav Nijinsky. The narrative is a gem. Scheherazade (Persian transliteration Šahrzâd) was a Persian Queen and the storyteller of the One Thousand and One Nights (Scheherazade in Wikipedia). Rimsky-Korsakov’s simply loved the story of Scheherazade. It had an oriental flavour, a flavour the “Mighty Handful,” the Five, wished to impart to the music of Russia. The music of Russia could not be altogether Western European. Russia stretches all the way to the Far East. Léo Bakst produced sets and costumes that constituted a brilliant dépaysement, or change of scenery. As the story goes, King Shahryar, whose wife has been unfaithful to him, vows to marry a virgin every day and have her beheaded the next day. When he meets Scheherazade, a thousand wives have already been beheaded. Scheherazade is therefore well prepared to entertain the King by telling him stories. Much against the will of her father, she volunteers to spend one night with the King. However, after the marriage is consumated, Scheherazade asks to be allowed to bid her sister Dinazade farewell. Dinazade’s role is to ask her sister to tell the King a story. The first night Scheherazade tells her story, but does not finish it in the hope that the King will want to hear the remainder the following night. The second night, Scheherazade not only finishes her first story, but she begins to tell another story which, again, she does not finish so the King will keep her alive. This goes on and on. Never has such a tribute been paid to storytelling, the art of the raconteur. That would be one of my conclusions. In all, Scheherazade tells the King a thousand and one stories over a thousand nights and then says that she has no more stories to tell. But all is well that ends well. King Shahryar has fallen in love with his storyteller and during the thousand nights, he has also fathered three children. In other words, he is no longer bitter and vindictive and makes Sheherazade his Queen. So now we know how powerful good storytelling can be. The effectiveness of the good raconteur has been confirmed. Therefore, to be a successful writer, it may be useful to write a page-turner and, if at possible, give it rhythm and powerful imagery. And it may go a good idea to tell it to music and, in the case of stories based on Scheherazade, burn incense: synesthesia, summoning every sense. I must close leaving details behind, but we have nevertheless looked at riveting storytelling and the magic of the trivialized “song and dance.” Ballet is not your ordinary “song and dance,” it is a great art form originating in Italy, France and Russia. But that is another story. Thank you, They are so alive. There have been and there great artists. Our blogs do have something in common. That is lovely. Thank you for writing a note. I have clicked the “follow” button. I think this website has got some rattling excellent information for everyone. “Glory is fleeting, but obscurity is forever.” by Napoleon.